The master plan is inspired by Kai Tak Airport in Kowloon City. The low flying plane casting shadow onto the street created a visual phenomenon that connect the neighborhood. It was a generational experience for the neighborhood. Our design reinterpret this thrilling memory in a contemporary way. 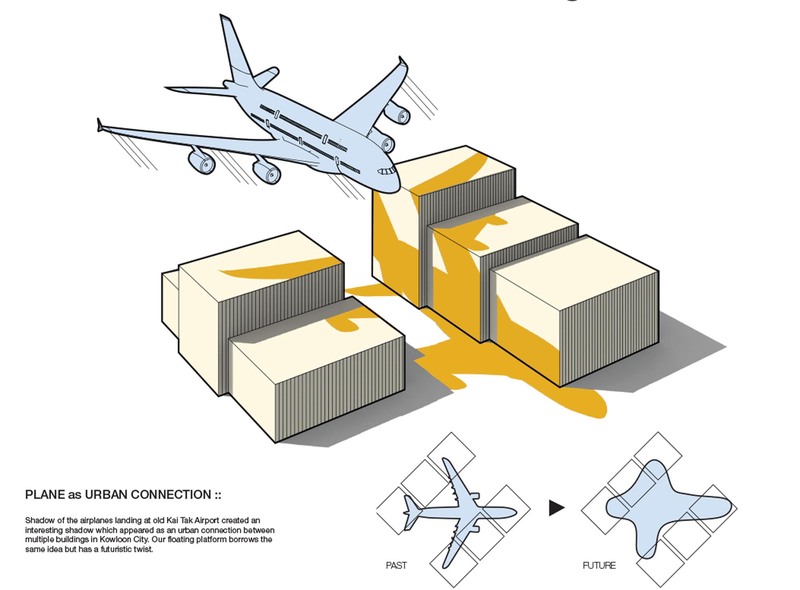 Several platforms were created as an abstract form of an airplane. They served as a bridge, a pool and a stair above the canal. The outline of the platform is once again connecting the surrounding buildings into a total design. It is a new brand identity that respect the history of Kai Tak development. At the tip of the harbor-front promenade, the platform extends into the harbor and creates a bigger area for recreation. The promenade is in alignment with Lion Rock, which makes this park design consistent to the Kai Tak master plan but also consistent to the spirit of historic Hong Kong. 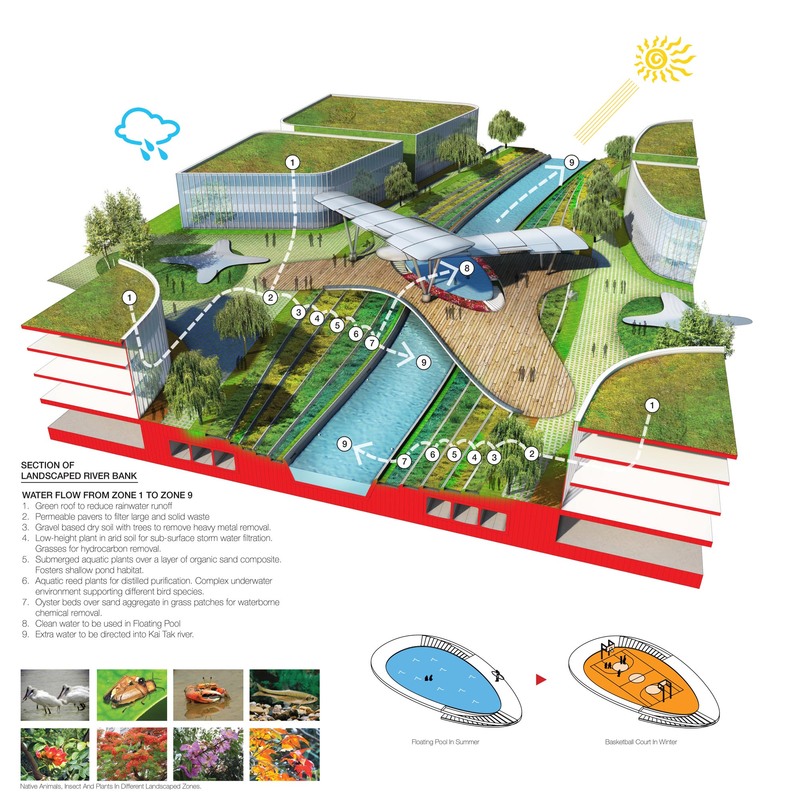 This park contains many green features, but the most important one is the multi-layer filtration system. 5 layers of terrace with different plants are built on both sides of the canal to filter water runoff from the neighborhood. Water is clean before they return to the river. Some of this water can be directed into the floating pool for recreational purpose. The landscaped layers will also make the project more resilient to heavy storm, while creating a natural habitat for different native plants, animals and insects. The other way to approach sustainable design is to give old structure a new purpose. To remain consistent with the airplane theme, we plan to re-purpose old airplane into canopy, bridge, and tunnel and outlook tower. It not only gives the park a signature structure, but it is an important lesson to inspire visitors to re-think the life cycle of built structure. The river has a newly built de-silting facility. We also think it is great opportunity to upcycle silt obtained from the facility and molded them into pavers for the park. Such pavement will be permeable while reducing our carbon footprint to transport silt out of the site. A learning center can also be established at the facility to demonstrate the process of upcycling waste. A successful park requires public involvement. 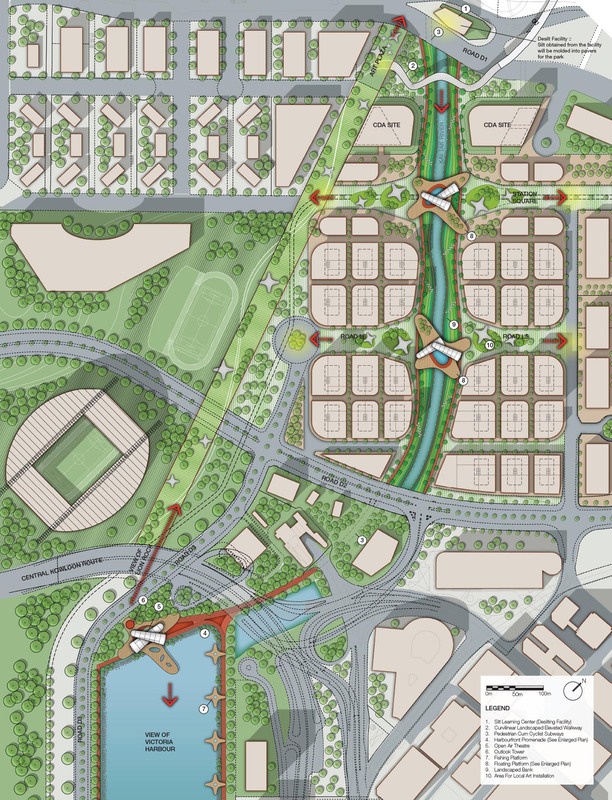 This master plan provides multiple area for art and recreational programs. 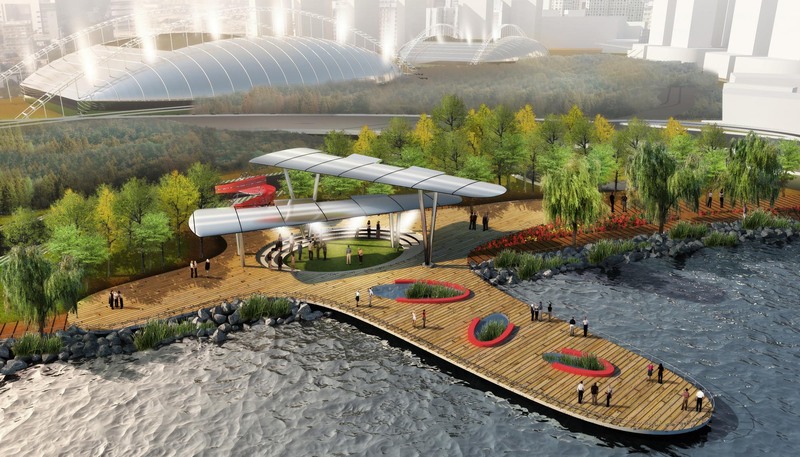 The floating platform provides a safe and clean way for the public to interact with waters. At various locations, these platforms become theatre, basketball court, fishing platform, art installation and learning center. The entire project will also be animated at night with dynamic lighting. It will echo the sport facilities and the laser show in Victoria Harbor. The canal at night will remind people of the old airport runway, while creating a new night life like Cheonggyecheon in Seoul. 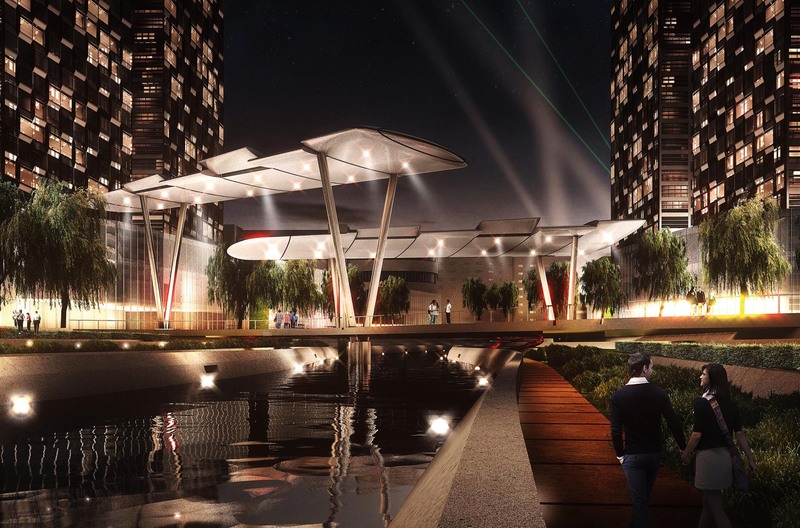 Such dynamic nightlife will make this into a hot spot for local residents and foreign visitors. 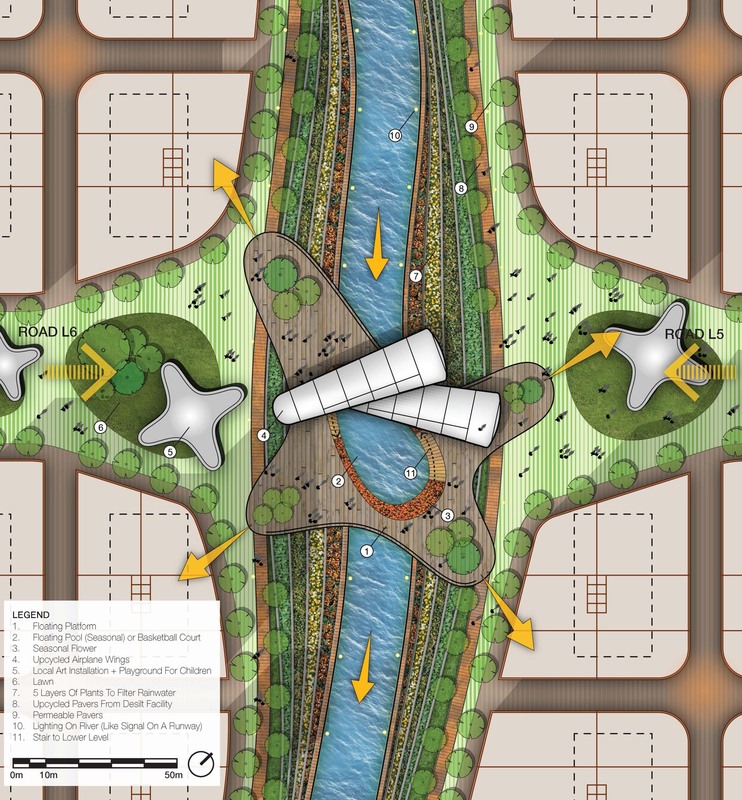 A seamless flow with contrast is the major idea behind our urban planning strategy. 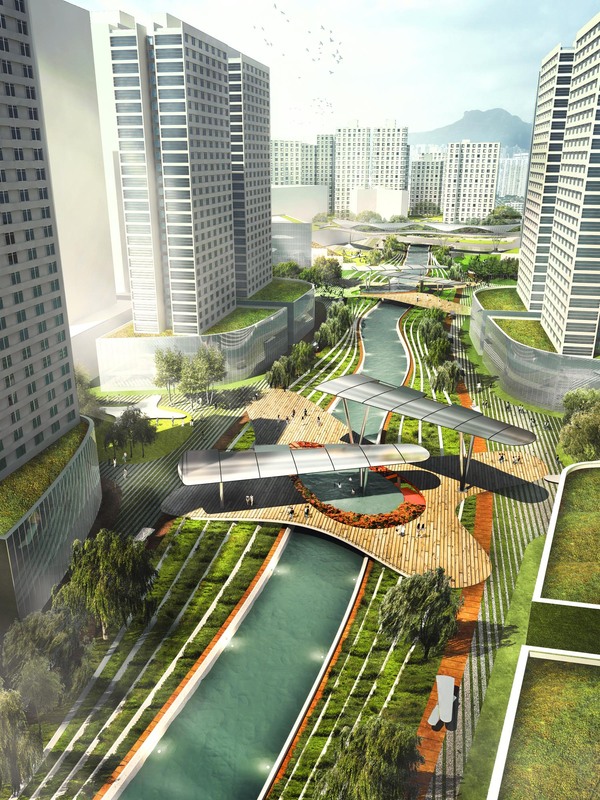 We believe Kai Tak River should be an integrated natural experience from one end at Choi Hung to the other end at the Harbor. The park itself should have consistent elements that flows with the master plan. 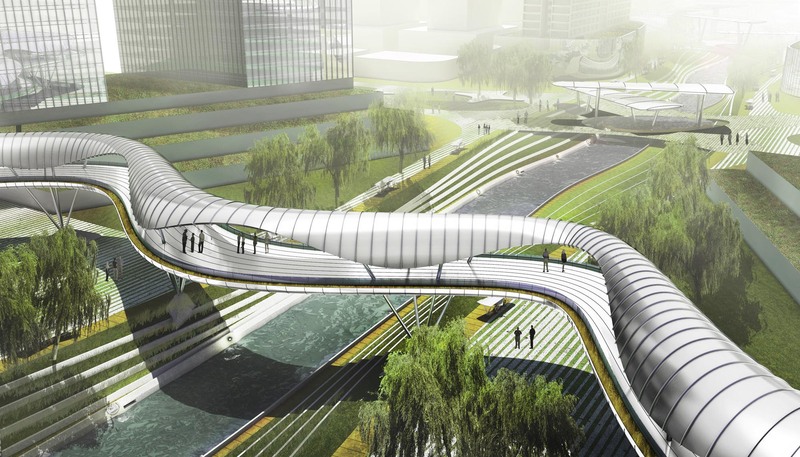 The bridge, the plaza, the river bank and tunnels should seamlessly flow into each other. We also think the buildings on both sides of the river should integrate with the park to achieve a total design. 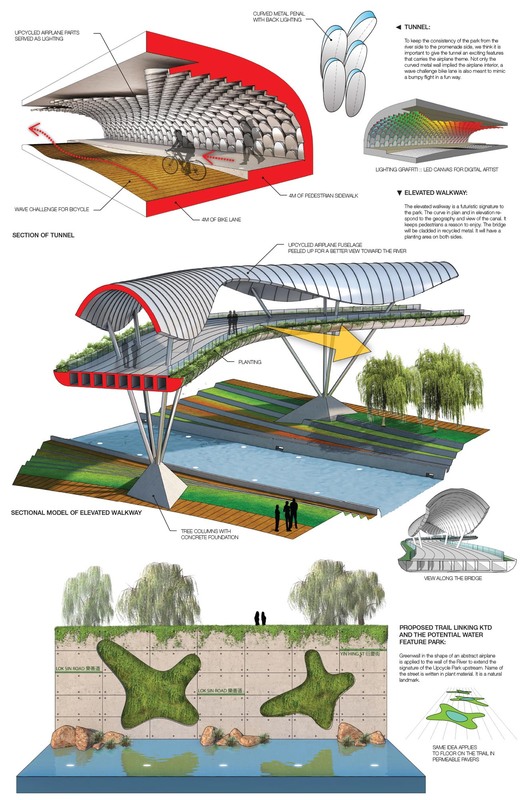 Adding entry points, providing suitable activities throughout the day and architecturally acknowledge the presence of the river and provide adequate solar penetration will help promote the river experience. Contrast is the other important to make the seamless flow interesting. We want to create landmark elements with program to demarcate different area along the river. They still flow with the layout and respond to different existing major streets, views and building, but each area will contain a unique identity. 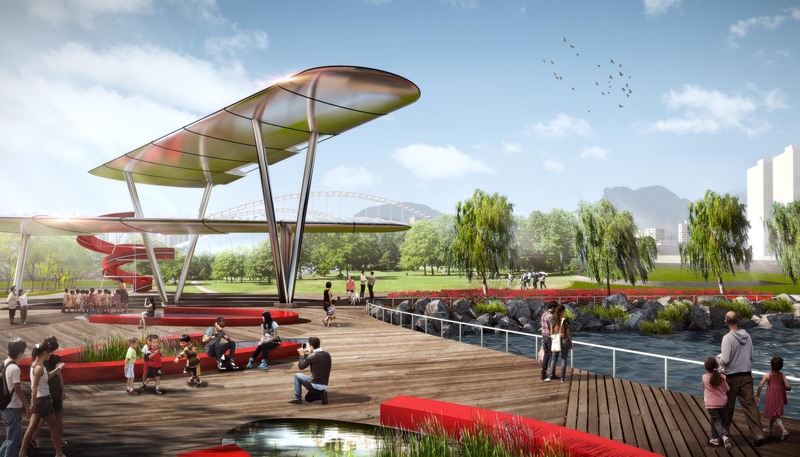 Visitors will have a reason to go from one end to the other end to experience to the rich local culture, while the park provokes them with new thoughts on sustainability. Below are the contrast elements that are included in our design. · Trail mark for runners.